For the duration of first hour, 102 students gathered to protest gun violence. 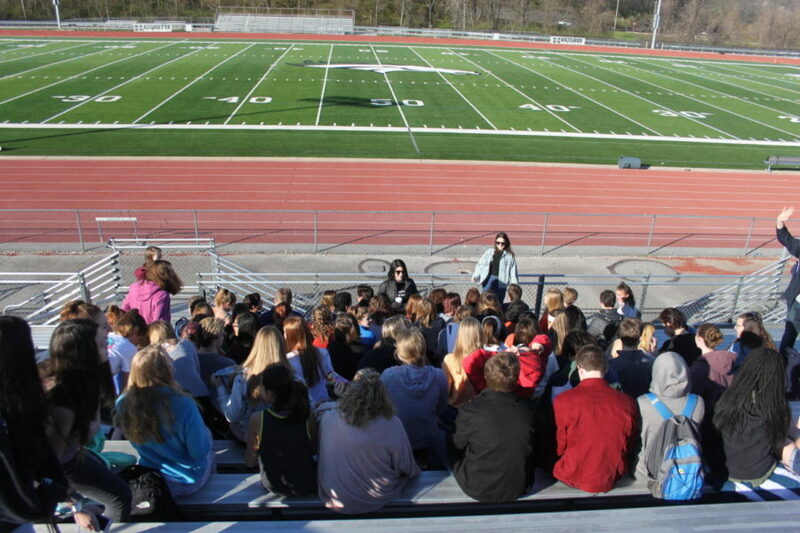 Students joined together in nine minutes of silence for the 30 killed in Columbine and Parkland combined. As some students chose to be in the student-led Walkout Friday morning, many others remained in class for multiple reasons. Kaley Lutker, sophomore, did not participate in the Walkout. She didn’t want to miss class and her father didn’t approve. Despite her choice, Lutker still supports the cause for gun control and believes the Walkout did raise more attention about the issue of gun control. “I think it could be a good way if everyone else agrees with it,” Lutker said. Many student athletes feared not being able to play their sport after school. Caitie Chismarich, sophomore, didn’t participate because she was scared of not being able to play at Jefferson City with varsity girls soccer. She said even if she was given the chance to go to the Walkout, she probably still wouldn’t participate. “I’ve never really been super into politics, so I don’t think I would participate,” Chismarich said. Since teachers weren’t permitted to participate in the Walkout, some wore orange to show their support for the Walkout. Robin Craig, language arts teacher, was one of those teachers. She said she wanted to support the lives of her students by wearing an orange jacket. “I wanted to show my students that I care about their safety and their lives,” Craig said. Craig said she thought the Walkout was a good way for students to express their opinion in a peaceful way. However, she doesn’t know how much of an impact it will have. “I think that the Walkout is a great way for the students to express their own opinions regarding the issue, but it’s not going to change the laws,” Craig said. Many other students believed the Walkout wasn’t enough to change gun control laws. Jenny Kolodiazhna, sophomore, said she doesn’t think skipping school will bring a change or impact the problem. In addition, Kolodiazhna had to take two Language Arts End of Course Exams, which she didn’t want to make up next week. Kolodiazhna said she thinks the Walkout was not a concern for the school’s safety for the administration because there were extra police officers present for the Walkout. Andris Zonies, senior, was another student who didn’t believe the Walkout would change the gun control laws. Along with that, he believed the cause for the Walkout wasn’t relevant to him. Tommy Mwintshi, senior, thought the Walkout was a good idea to raise awareness about the gun control issue, but he chose not to participate so he wouldn’t miss class. He thinks it’s important that more schools in the U.S. start reaching out and spreading awareness. “The more high schools that do it, the more change that can actually happen,” Mwintshi said.